With one of the best restaurant settings on island, Sheer Rocks has continued to keep at the top of many ‘must visit’ lists. 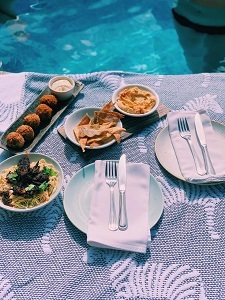 The restaurant’s young owners have successfully turned it into a chic hangout for guests to enjoy long lunches with their unique tapas menus, day beds and plunge pool; sybaritic for daytime lounging. At night, Sheer Rocks is transformed into a romantically cool and stylish retreat for dinner, where the six, tiered wooden pavilions hang over flood lit rocks, with the waves crashing gently below. 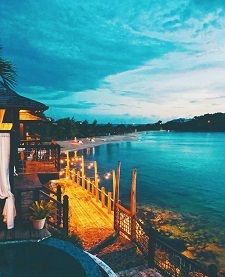 The walkway from Cocobay Resort leads down to the restaurant's palm thatched bar and lounge decks. Four-poster day beds clad with billowing white curtains sit waiting aside the sparkling plunge pool. A bright, friendly smile greets you as you gaze at the indescribable view, and you very quickly realize that this is not your average restaurant. The vibe is very much relaxed and social for both lunch and dinner. The a la carte menu is small, but hard to choose from, the dishes simple, yet innovative. The tapas lunch menu, large, with lots of small plates to share from; fitting to the Mediterranean cuisine brilliantly interpreted by the talented British chef and his team. 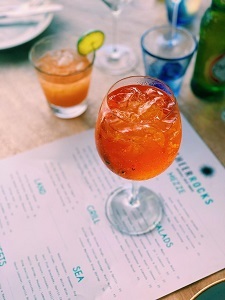 The Rocks bar, day beds and plunge pool are the perfect place for a sunset aperitif, or to while away a whole Sunday, alongside a backdrop of sultry lounge beats, unrivaled views and an affordable list of quality wines and inventive cocktails. Sheer Rocks philosophy emphasizes simplicity. With discreet yet super friendly service, it is clear to see the heavy support of the best ingredients from the island, all complimenting this delightfully fun eatery and keeping their long list of dedicated followers, coming back for more. Sheer Rocks is available to hire for special occasions. All events are tailor-made to suit any personal style and budget, from specifically designed menus, flowers, cakes and table decorations to bands, dj’s and fireworks.